Contrails (short for “condensation trails”) or vapor trails are long thin artificial (man-made) clouds that sometimes form behind aircraft. Their formation is most often triggered by the water vapor in the exhaust of aircraft engines, but can also be triggered by the changes in air pressure in wingtip vortices or in the air over the entire wing surface. Like all clouds, contrails are made of water, in the form of a suspension of billions of liquid droplets or ice crystals. Depending on the temperature and humidity at the altitude the contrail forms, they may be visible for only a few seconds or minutes, or may persist for hours and spread to be several miles wide. The resulting cloud forms may resemble cirrus, cirrocumulus, or cirrostratus. Persistent spreading contrails are thought to have a significant effect on global climate. 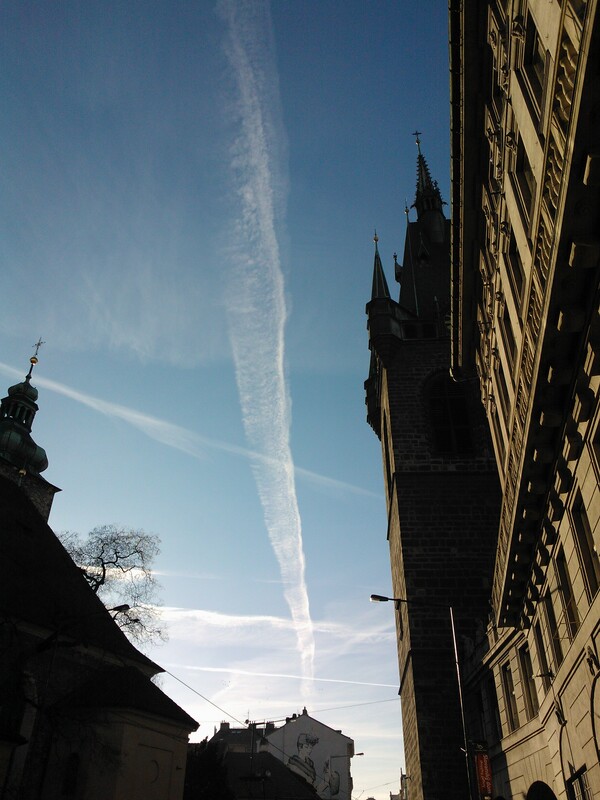 The above pictured contrails are taken in Prague’s residential district Vinohrady, namely in Anglicka street. (Above) Somewhat dispersed aircraft contrails behind no-longer visible planes. Picture taken in Jindrisska street in Prague. This entry was posted in Life/Photography and tagged Aircraft, Airplane, COndensation Trails, Contrails, Czech Republic, Planes, Prague Vinohrady, Praha, Sky, Vapor trail, Vinohrady. Bookmark the permalink. I love contrails. I have captured quite a few, some created deliberately by airplanes. They are fascinating and make such wonderful designs in the sky, particularly when the sun is going down.